There are a number of great companies in the market today. 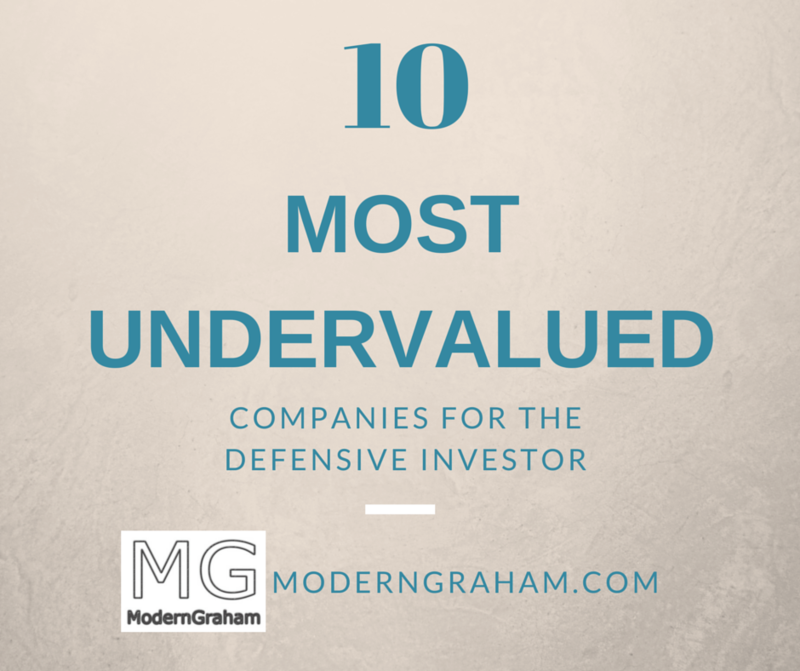 By using the ModernGraham Valuation Model, I’ve selected the ten most undervalued companies reviewed by ModernGraham. Each company has been determined to be suitable for Defensive Investor according to the ModernGraham approach. Defensive Investors are defined as investors who are not able or willing to do substantial research into individual investments, and therefore need to select only the companies that present the least amount of risk. Enterprising Investors, on the other hand, are able to do substantial research and can select companies that present a moderate (though still low) amount of risk. Each company suitable for the Defensive Investor is also suitable for Enterprising Investors. Be sure to check out the history of this screen to find out which companies have been selected in the past! FMC Corporation qualifies for both the Defensive Investor and the Enterprising Investor. The Defensive Investor’s only initial concern is the low current ratio while the Enterprising Investor is only concerned with the level of debt relative to the net current assets. As a result, all value investors following the ModernGraham approach based on Benjamin Graham’s methods should feel comfortable proceeding with further research into the company. CF Industries Holdings Inc. qualifies for both the Defensive Investor and for the Enterprising Investor. The Defensive Investor is only concerned by the low current ratio while the Enterprising Investor’s only concern is the level of debt relative to the net current assets. As a result, all value investors following the ModernGraham approach based on Benjamin Graham’s methods should feel comfortable proceeding with further research into the company. Yahoo! Inc. qualifies for the more conservative Defensive Investor or the Enterprising Investor. Both investor types are only concerned by the lack of dividend payments. As a result, all value investors following the ModernGraham approach based on Benjamin Graham’s methods should feel comfortable proceeding with the analysis. Twenty-First Century Fox Inc. qualifies for the both the Defensive Investor and the Enterprising Investor. The Defensive Investor is only concerned with the insufficient earnings stability over the last ten years. The Enterprising Investor is only concerned by the level of debt relative to the net current assets. As a result, all value investors following the ModernGraham approach based on Benjamin Graham’s methods should feel comfortable proceeding with further research into the company. Eastman Chemical Company qualifies for either the Defensive Investor or the Enterprising Investor. The Defensive Investor is only initially concerned with the low current ratio, while the Enterprising Investor is only concerned with the level of debt relative to the net current assets. As a result, all value investors following the ModernGraham approach based on Benjamin Graham’s methods should feel comfortable proceeding with the next stage of the analysis. Paccar Inc. qualifies for the both the Defensive Investor and the Enterprising Investor. The Defensive Investor is only concerned with the insufficient earnings growth over the last ten years. The Enterprising Investor has no initial concerns. As a result, all value investors following the ModernGraham approach based on Benjamin Graham’s methods should feel comfortable proceeding with further research into the company. Deere Corporation qualifies for both the Defensive Investor and the Enterprising Investor. The company passes all of the requirements of both investor types, a rare accomplishment indicative of the company’s strong financial position. As a result, all value investors following the ModernGraham approach based on Benjamin Graham’s methods should feel comfortable proceeding with further research into the company. Qualcomm Inc. qualifies for the both the Defensive Investor and the Enterprising Investor. The company passes all of the requirements of both investor types, a rare accomplishment indicative of the company’s strong financial position. As a result, all value investors following the ModernGraham approach based on Benjamin Graham’s methods should feel comfortable proceeding with further research into the company. The author held a long position in Deere & Co (DE) but did not hold a position in any other company mentioned in this article at the time of publication and had no intention of changing that position within the next 72 hours. See my current holdings here. This article is not investment advice; any reader should speak to a registered investment adviser prior to making any investment decisions. ModernGraham is not affiliated with the company in any manner. Please be sure to review our detailed disclaimer.